The Prime Minister's website does not comply with current Canadian Government standards for website design. This is a view of the PM's Photo Gallery as it now appears, showing the central images — seven photos — that should be supplied with ALT text. The descriptive text, that should appear on-screen, is missing. The small yellow rectangles, superimposed on the seven central photos, are empty. They should be displaying descriptive text. 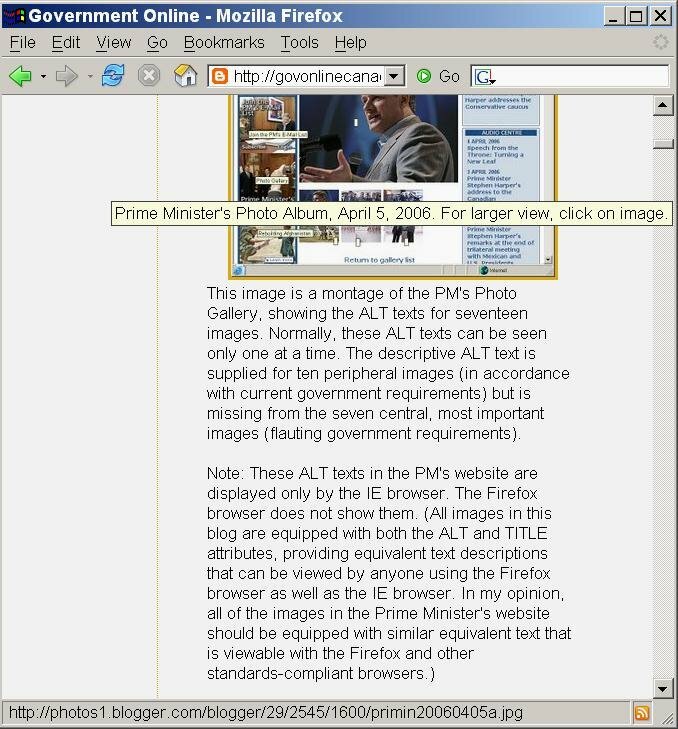 A larger view (next below) of the same screen, shows the ALT text is supplied for the peripheral images (in accordance with current government requirements) but is missing from the seven central images (contrary to official government requirements). 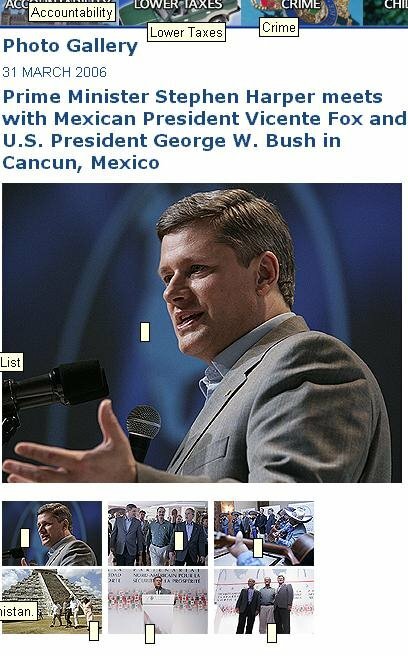 This image is a montage of the PM's Photo Gallery, showing the ALT texts for seventeen images. Normally, these ALT texts can be seen only one at a time. The descriptive ALT text is supplied for ten peripheral images (in accordance with current government requirements) but is missing from the seven central, most important images (flauting government requirements). 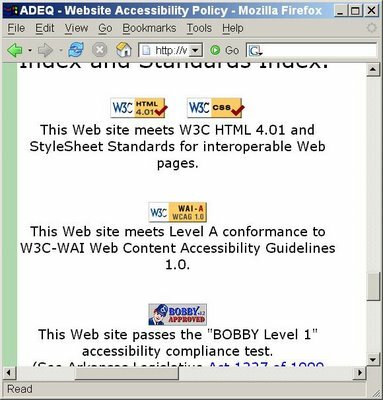 The current GoC (Government of Canada) requirement states: "All GoC Web sites and their pages must incorporate text equivalents for non-textual elements, such as graphics and images...to ensure universal accessibility goals are achieved." "Equivalent information may be provided in a number of ways, including through attributes (e.g., a text value for the alt attribute in HTML...)... 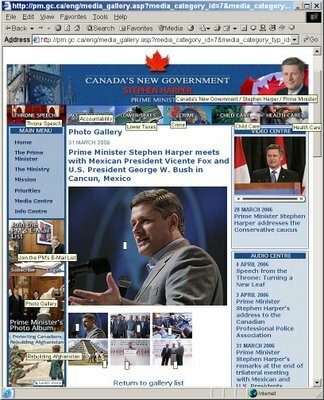 Text equivalents must be written so that they convey all essential content..." [This is where the Prime Minister's website fails to meet the requirements — the alt attribute is empty, when it should contain text that describes the photograph.] The name alt is a short form of alternative text. The following appears in the Common Look and Feel section: "The Government of Canada requires that all federal agencies share a common look and feel for federal Internet / Intranet sites and electronic networks. The Common Look and Feel policy specifies the consistent application of the Federal Identity Program, Official Languages Policy, and accessibility standards to all electronic services, including Government of Canada Internet / Intranet sites, products and deliverables." A screenshot of this blog, showing equivalent text displayed by the Firefox browser, enabled by the inclusion of a TITLE attribute in the website design. All of the images in the Prime Minister's website should be equipped with a non-empty ALT attribute, and a TITLE attribute as well. The Firefox browser rsponds to the TITLE attribute by displaying it in a pop-up yellow box when the cursor hovers over the image (see the screenshot next above). Netscape 6.x responds to the TITLE attribute in the same way as Firefox. The Safari browser responds to the TITLE attribute, but in its own unique way — the TITLE text is rendered in the status bar at the bottom of the screen, prepended to the target URL (assuming you've overridden the Safari default that leaves the status bar hidden). The Opera browser displays the TITLE text both as a pop-up tooltip and in the browser's status bar. 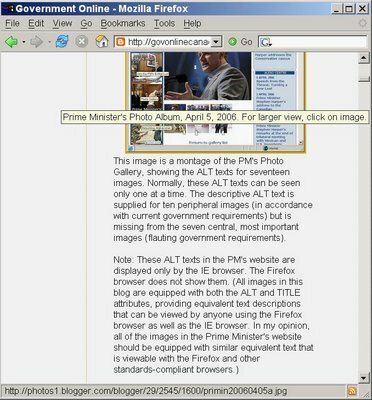 [PS April 10, 2006 23:35 UTC]:– Maybe the PM's website should display compliance assurance, something like the following screenshot view, taken April 10, 2006, of part of a government website. 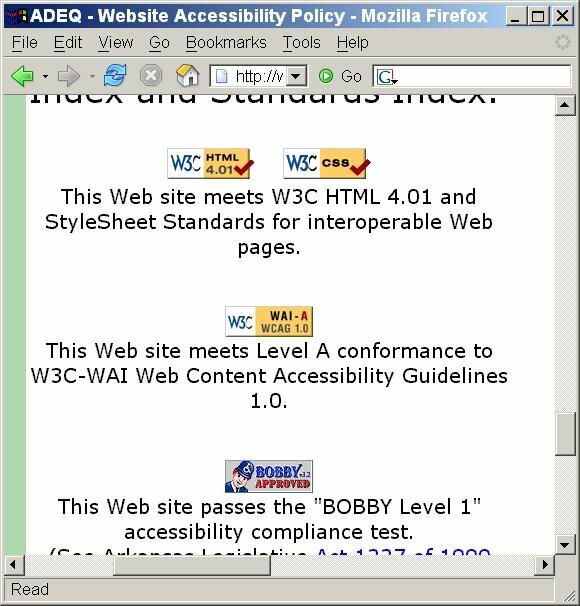 Standards compliance assurance, as shown in a government website, April 10, 2006.